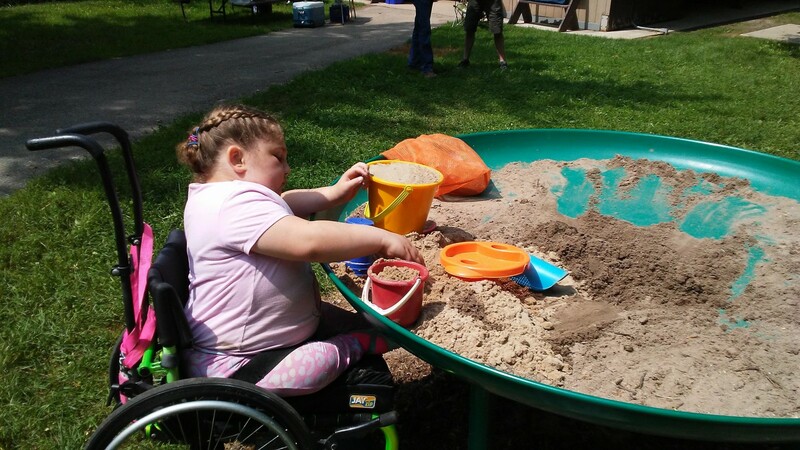 At my family picnic, Namine got to play in a wheelchair-accessible sandbox. My family picnic this year was at the Kettle Moraine state park. Close by where we were set up, there was what appeared to me a fire pit. (I’m not the only one; several other family members said the same thing.) Upon closer inspection, though, it was a sandbox. Well, less of a “box,” but “sand-round-thing” doesn’t roll off the tongue quite as well. It was just the perfect height for Namine in her wheelchair. She was able to roll right up to it and start playing. We hadn’t brought any sand toys — swimming gear, yes, but it was a little too cold for that, we thought. Fortunately, one of Namine’s similar-aged cousins had, and was more than willing to share.